File image of school bus. 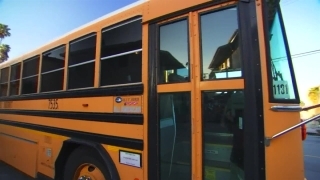 The San Ramon Unified School District on Monday announced that it had found yet another incidence of racist graffiti, this time on a Traffix school bus that carries students from Danville’s Monte Vista High School. What was written was not exactly spelled out. This is the sixth time homophobic or racially-charged graffiti has been found in the district, which is made up of predominantly white students, since Oct. 18. At California High School in San Ramon, there have been four reports of vandalism, while Monte Vista has been targeted twice. Nat Rojanasthira, an assistant to the town manager for the city of Danville, confirmed that the graffiti had been found on the back of one of the bus seats, but declined to go into details citing the ongoing investigation. The Danville Police Department will continue its investigation while the school is on Thanksgiving break, while the district will continue looking into the matter once classes resume, Rojanasthira said. First Student, the largest school bus provider in the U.S, operates the Traffix busses. The company could not immediately be reached for comment. The rash of vandalism has been the subject of student-organized walkouts and faculity-led assemblies. At each passing, district officials have attempted to assuage fears that the school is not a welcoming place for minorities, ratcheting up efforts after an African-American student went into one of Monte Vista’s restrooms and discovered the words “White” and “Colored” scrawled above two urinals. "I am all too aware of how far we have come as a nation in our pursuit of treating all people with dignity and respect," Supt. Rick Schmitt wrote in a message to students. "And yet, events across the nation and in our own community continue to demonstrate the need to teach our children about tolerance and cross-cultural understanding." He suggested that the 2016 election has influenced campus climate. “The words exchanged on the campaign trail and the racist words written on bathroom walls cry out for how much we need to support, teach and listen to our children,” he wrote. During a protest, district students also rebuked the campaign’s rhetoric, saying there is no place for it on campus. Throughout the Bay Area and the nation, racist attacks, verbal and physical, are being reported at an alarming rate, according to hate-tracking groups. And many are blaming President-elect Donald Trump — a favorite of the "alt right" and the Ku Klux Klan — as the culprit for unleashing pent-up racist emotions. As of Monday, the Southern Poverty Law Center had noted 701 reports of hate harrassment since the day after Election Day. As recent as Sunday, however, Trump, in an interview on 60 Minutes said he was unaware of these hate crimes, but told America, if true, to "stop it." Gillian Edevane covers Contra Costa County for NBC Bay Area. Contact her at Gillian.Edevane@NBCuni.com.